I love snacking and could easily make a meal from appetizers alone. My favorite snack would have to be cheese and crackers or bread. It's like a step up from bagged potato chips (which I love too!) and more appropriate for dinner guests. Our friends came over for dinner tonight and they love appetizers as much as I do. I came across this recipe from Tyler Florence and knew it had to be one for us to nosh on before dinner. 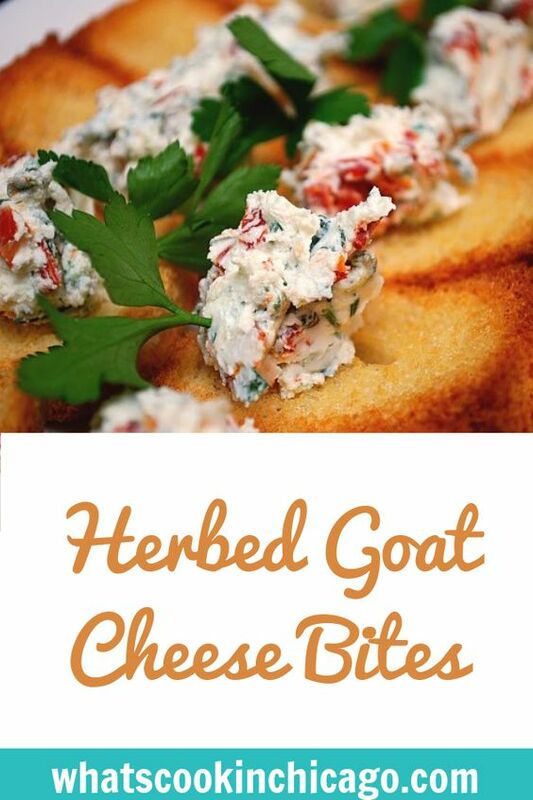 It's simple and the herbed goat cheese can be done in advance so that the fresh herbs can really flavor the cheese. What makes this appetizer even more elegant is the bread the cheese is served on. Using a muffin pan, you can transform a plain flat piece of bread into a beautiful and tasty vehicle for dipping or serving. It makes for quite a nice presentation but even better is eating it! * Not a fan of goat cheese? Have no fear... feel free to substitute the goat cheese with 8 oz of cream cheese + a squirt of lemon juice for tang! Combine and finely chop the fresh herbs. Place the chopped herbs and sun dried tomatoes in a bowl and combine with the softened goat cheese until fully incorporated. Cover bowl in plastic wrap and chill at least 2 hours or up to 24 hours. Preheat oven to 350°. Prepare the bread slices by cutting off the crusts. Cut each slice in half and gently press each half slice into muffin cups in muffin pans. Drizzle bread slices with olive oil or spray with cooking spray. Bake the bread in muffin tins at 350° for 7 to 9 minutes or until crisp and lightly browned. Remove from oven; let cool in pans 5 minutes. Place a dollop of the goat cheese mixture onto the toasted bread slices and serve. This looks so good! Cuban crackers would be perfect as well for this. Yum! Yummy, Joelen! These look so simple and delicious - perfect for a party! These are beautiful. I wanted to reach out and take a bite! I LOVE goat cheese. These look perfect for a party!